MK DONS | Martin; Spence, McFadzean, Kay, Lewington (c); Potter, Poyet; Bowditch (Powell 79), Carruthers, Murphy (Baker 62); Maynard (Gallagher 86). SUBS | Cropper, Hodson, Baker, Hall, Benavente, Powell, Gallagher. WOLVES | Ikeme; Iorfa, Batth (c), Williamson, Golbourne; McDonald, Price, Henry, Edwards (Le Fondre 64), Graham (Ojo 64); Afobe. SUBS | Flatt, Doherty, Coady, Ojo, Byrne, Holt, Le Fondre. thanks for the blog gentlemen, see you next week. shame about the result ! yes in US we put up lights day after Thanksgiving! Cheers for your company everyone. 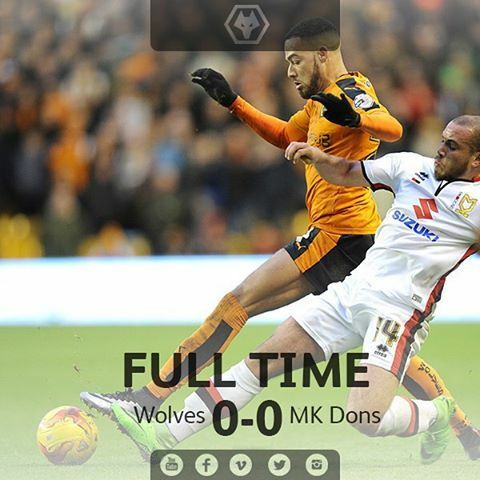 VERY GOOD BLOG carly ,,and otto I am a wolves fan 4 ever . Texas, you have a christmas tree up already? !